The Justice Department on Tuesday filed a notice that it would appeal a recent court decision that struck down three controversial workforce executive orders President Trump signed earlier this year to make it easier to fire federal workers and reduce the influence of federal employee unions. In a notice filed in U.S. District Court for the District of Columbia, Assistant Attorney General Joseph Hunt said the administration will seek to overturn the August decision by U.S. District Judge Ketanji Brown Jackson, which found that the key provisions of the executive orders were unlawful. In May, Trump signed a series of executive orders targeting federal employee unions. The first standardized the length of performance improvement plans at 30 days and removed adverse personnel actions from the administrative grievance process. Another order sought to set time limits on collective bargaining negotiations between federal agencies and labor groups, while the third order severely limited the use of official time by union employees, restricted what activities could be conducted on official time, and ordered agencies to stop providing unions with office space and other agency property rent-free. More than a dozen federal employee unions challenged those orders in court, and in August, Jackson sided with labor groups, finding that the key provisions of the orders, taken together, amounted to an “evisceration” of the right to collectively bargain as guaranteed in the 1978 Civil Service Reform Act. "The orders’ requirements, such as the directive that agencies should 'ordinarily' seek to conclude collective bargaining negotiations within five to seven months, or should limit the applicability of grievance procedures 'whenever reasonable,' effectively instruct federal agencies and executive departments to approach collective bargaining in a manner that clearly runs counter to the [law's] expectation of good-faith conduct on the part of negotiating parties," she wrote. Since the executive orders were struck down, the Office of Personnel Management rescinded guidance on how to implement their provisions, and indicated that agencies should “fully comply” with the court decision, although Director Jeff Pon said the administration was still contemplating next steps in the legal battle. 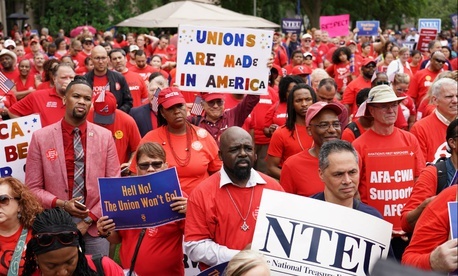 Although some agencies pulled back unilaterally implemented provisions of the orders, unions have reported that departments, like the Health and Human Services Department, have continued to push for provisions of the executive orders through collective bargaining negotiations. Last week, American Federation of Government Employees Local 3399 filed a contempt motion against the Veteran Affairs Department, accusing officials at a VA hospital in Missouri of repeatedly ignoring calls to comply with the executive orders, and even after rolling back provisions limiting official time, intentionally denying union officials’ requests for official time. That motion was dismissed after Justice Department lawyers said the local union had not properly conferred with them. But Michael Glavin, president of AFGE Local 3399, said he attempted to confer with VA lawyers for at least a week, but were ignored. Glavin said Monday that the union plans to confer with Justice Department attorneys and refile its contempt motion. It was not immediately clear Tuesday how the appeal could impact those proceedings.